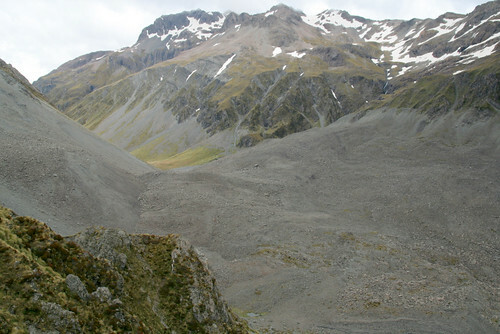 we had followed the route from the Edwards valley (top left) and across the debris field (900m) to the foot of the slope from which the photo is taken. The debris is a massive rock slide: Half of Falling Mountain above us on the left collapsed during an earthquake in 1929. The pulverised rock buried the head of the Otehake river, surged 100m up the other side and continued several kilometers down valley to our right in this photo. Shows well on google maps/earth. The debris is slowly revegetating at quite different rates (?). I wonder if the debris is actually from a series of slides at different times.